The four pit bull dogs that viciously attacked UPS driver Kevin Backlund in September of 2017 will be euthanized sometime today by the Pierce County Humane Society. Victim Kevin Backland is unavailable for comment due to a full day of medical appointments and physical therapy. However, he asked us to share the following statement. 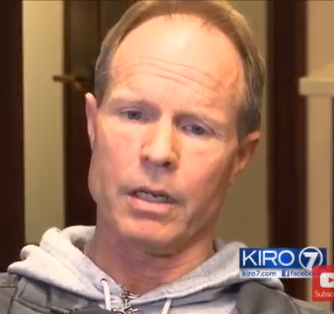 Earlier this month attorney Chris Davis filed a lawsuit in Pierce County Superior Court (No. 18-2-04368-4) on behalf of UPS driver Kevin Backlund against the dog owners and the multiple businesses that operate on the property where the attack took place. The Pierce County Prosecutor’s office has yet to determine if it will file criminal charges against the owners. September 13, 2017 – The four pit bulls attack Kevin Backlund as he tries to deliver a package. September 15, 2017 – Victim Kevin Backland hires attorney Chris Davis to represent him in civil legal claims against the owners. More information. September 22, 2017 – Pierce County Animal control filed a complaint (No. 17-1-51778) and warrant for removal of the animals alleging Felony Dog Bite under RCW 16.08.100 (3). September 23, 2017 – Pierce County Animal Control serves the dog owners with a ‘dangerous animal declaration’. September 27, 2017 – Through their attorney, the dog owners officially notify the Pierce County Auditor’s office that they wish to appeal the dangerous animal declarations. October 12, 2017 – 911 tapes released. More on 911 tapes. November 30, 2017 – Dangerous Animal Appeal Hearing was conducted at the Pierce County Annex building. The hearing examiner heard testimony from victim Kevin Backlund, officials from Pierce County Animal Control and Orting Valley Fire and Rescue. More on hearing. December 29, 2017 – The Pierce County hearing examiner releases his decision. The dangerous dog declaration will remain in place. In order to regain possession of the dogs the owners would have to comply with Pierce County dangerous animal ownership requirements. If they do not comply within 20 days (January 18, 2018) of the decision the animals will be seized and destroyed within 5 days. More on decision. January 3, 2017 – Civil lawsuit filed in Pierce County Superior Court (No. 18-2-04368-4) against the dog owners and the multiple businesses that operate on the property where the attack took place. January 12, 2018 – Pierce County Animal Control has contact with the dog owners who state that they plan to comply with the Dangerous Animal Ownership Requirements and scheduled an inspection of compliance with those requirements for January 18th. January 18, 2018 – Pierce County Animal Control visits the property for the inspection of animal enclosures. The owner then informs them that he cannot comply with the requirements and surrenders (signs over ownership of dogs to the county) the dogs.